Australian Women’s Weekly is here to help to transform your lifestyle with their fantastic new cookbook. The Mediterranean Diet is the perfect way to make a positive change in your life. Spread over five sections – ranging from Breakfast & Light Meals to Family Feasts – this new recipe collection is sure to transform the way you eat. The book promotes the idea of using fresh ingredients and a healthy produce to improve your lifestyle as well as learn to improve your appreciation for the food you eat. From chickpea pancakes to lamb bretonne, you’re sure to find plenty in here that your tastebuds will agree with! Australian’s Women’s Weekly has you covered with this wonderful collection. There’s a reason that so many women trust them! So stop settling for sub-standard and add some fresh deliciousness into your life. 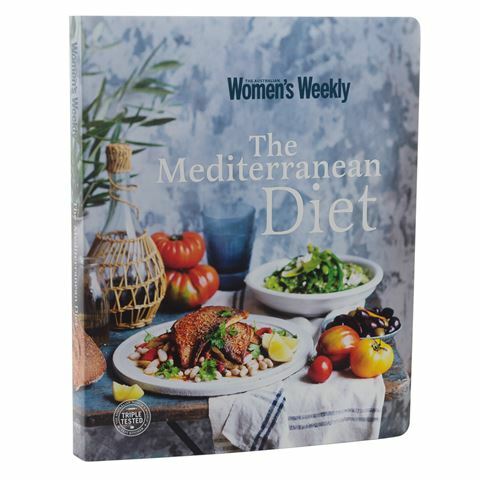 Grab Australian Women’s Weekly: The Mediterranean Diet now. Dozens of recipes featuring fresh and flavoursome ingredients. Five sections covering different meals and occasions. Each recipe is accompanied by lush photography. Published by Bauer Media Books. Dimensions: 24cm (l) x 29cm (h) x 2.5cm (w).